Hydrogen buses that were once lauded as the future of clean transportation in B.C.are being replaced by old-fashioned diesel power. The 20 vehicles were part of a high profile, $90-million plan to showcase hydrogen power during the 2010 Winter Olympics in Whistler. BC Transit is now taking bids on the buses and will either sell them off or have them converted to use diesel or other fuel. They have been in storage for several months and each has roughly 200,000 kilometres on the odometer. In a written release, BC Transit said it&apos;s exploring various options for the hydrogen buses, and its bidding process closes on Dec. 19. It declined a request for an interview from CBC News. The decision to kill the fleet has Canada&apos;s hydrogen proponents fuming, including Eric Denhoff, President and CEO of the Canadian Hydrogen and Fuel Cell Association. He is highly critical of BC Transit&apos;s decision, saying they should have kept the buses on the road as a demonstration project, despite their higher operating costs. "Even if there was a bit of additional cost to running these things, you now have to go out and buy 20 new diesel buses to replace them, so I don&apos;t understand how the math on that works," said Denhoff. He says electric trolley buses also cost more than diesels, but TransLink manages to keep a large fleet of them on the road in order to further other goals, such as reducing pollution. Denhoff once served as chairman of BC Transit but, he says, they aren&apos;t receptive to new ideas. "I just think management there doesn&apos;t like new technology." He denies this was a failed experiment, saying it helped proved the technology is viable and kept thousands of tonnes of greenhouse gases out of the air. The only tailpipe emission from the buses is water, but the hydrogen fuel had to be trucked in from Quebec. 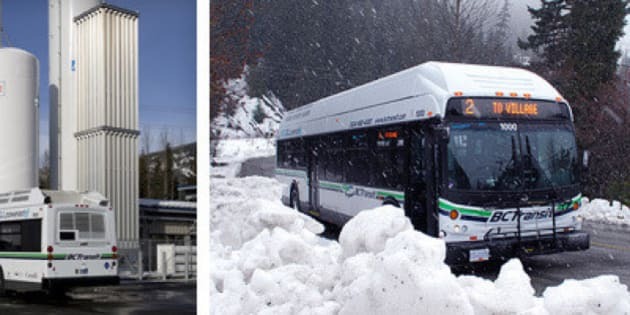 According to Burnaby&apos;s Ballard Power Systems, which manufactures fuel cell engines, Whistler&apos;s hydrogen buses cost $1.34 per kilometre to maintain, versus 65 cents per kilometre for diesel-powered buses. The federal government contributed $45 million and the B.C. government provided $44.5 million for the manufacture of the buses and to cover some of the capital and operating expenses. The Fuel Cell Association says hydrogen powered transport is moving ahead in Canada. Denhoff says B.C. is Canada&apos;s hub for the industry and it now employs almost a thousand people in the Vancouver area. He points to Ballard Power Systems manufacturing thousands of fuel cell engines for use in commercial forklifts, one of the early commercial successes for hydrogen power. "We&apos;re selling our stuff all over the world and you would think that the management of the transit company would be helping us," he said.